Be the first to share your favorite memory, photo or story of Janie . This memorial page is dedicated for family, friends and future generations to celebrate the life of their loved one. Janie Elizabeth King, also affectionately known as “Sue,” was born on February 26, 1939 to the late George Kilpatrick, Sr. and Mildred Williams of Kinston, North Carolina. Janie attended the Lenoir County School system in Kinston, North Carolina along with her sisters: Doris Bouldin and Ella Brooks. She was a member of Jericho Church on Greenville Highway 11 in Kinston where she accepted Christ at an early age. She graduated from Savannah High School in 1957. After graduation, she worked at Kinston Hospital and the Savannah High School Cafeteria until moving to Brooklyn, New York and later relocating to Newark, New Jersey. Janie married Lynwood King who also attended Savannah High School and with this union two children were born, a daughter, Selmenia Diane King and a son, Dexter Earl King. Janie worked for The Display Box Company in Harrison, New Jersey for 16 years while residing in Roselle, New Jersey. She later worked as a Childcare Supervisor at the Roselle Day Care Center in Roselle and a Home Health Aide in Cranford. She joined the First Baptist Church in Linden where she served faithfully for 42 years until her health began to fail. She was a member of the Woman’s Day Ministry, Missionary Ministry, the Senior and Mass Choirs and served as the President of the Pastor’s Aide Committee as well as attending Bible Study. She received a Women’s Day Award for her Christian Spirit and Dedication to First Baptist Church on August 28th 1994. Janie loved going to church, singing and serving the Lord. In addition, she loved traveling, cooking, baking, gardening, her figurine collection and spending time with her family and friends. She was especially known for Thanksgiving and Christmas Turkey dinners along with her infamous hush puppies, sweet potato pie, German Chocolate and Carrot cakes. On Wednesday March 20, 2019, Janie Elizabeth King passed from Earth to Glory peacefully in the comfort of her home. Janie was preceded in death by her daughter, Evangeline Bernette Davis and two brothers, Olester Kilpatrick and Lawrence Kilpatrick. 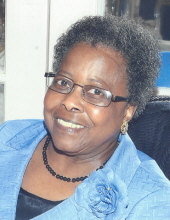 She leaves to cherish her memories, her husband of 58 years, Lynwood E. King; daughter, Selmenia Diane King of Roselle, NJ; son, Dexter E. King (Erica) of Sayreville, NJ; stepson, Leon Anthony Swinson of Kinston, NC; nine sisters: Doris Bouldin of Linden, NJ, Ella Brooks of Roanoke, VA, Linda Smith of Kinston, NC, Janet Bundy (Jeff) of Vanceboro, NC, Wanda Rasberry of Kinston, NC, Michelle Brown (Darryl), Stacy Cobb (Gregory) of Greensboro, NC, Mattie Kilpatrick Battle (Thomas) of Rocky Mount, NC and Theon Warren of Kinston, NC; 13 brothers: George Kilpatrick, Jr. (Carrie) of Warsaw, NC, Willie Kilpatrick (Essie), Franklin Kilpatrick (Reatha), Melvin Kilpatrick (Linda) all of Kinston, NC, Luby Kilpatrick of Maury, NC, Levon Rasberry (Juanita), Demetrice Rasberry (Barbara), Ronnie Rasberry (Charlotte) all of Kinston, NC, Jeffrey Rasberry (Angel) of Maryland, Gregory Rasberry of Fayetteville, NC, Reginald Rasberry of Kinston, NC, Michael Kilpatrick (Katrina) and George Kilpatrick II (Consuela) of Raleigh, NC; four grandchildren: Talesa Mewborn (Michael) of Kinston, NC, Rafiq Sampson of Scotch Plains, NJ, Alvin G. Davis Jr. (Shanice) of Durham, NC and Brandon King of Sayreville, NJ; four great-grandchildren: Destanie Davis, Amaré Mewborn, Aria Davis and Alvin X. Davis; great-granddaughter to be born in August, and a host of aunts, uncles, nephews, nieces, cousins, in-laws and friends. To send flowers or a remembrance gift to the family of Janie Elizabeth "Sue" King, please visit our Tribute Store. "Email Address" would like to share the life celebration of Janie Elizabeth "Sue" King. Click on the "link" to go to share a favorite memory or leave a condolence message for the family.